I think it’s time to hold a competition and offer a copy of The Banker as a prize. In chapter one Strelnikov shows Sir Phil Black around his ‘cottage’. The rooms have something in common. What is it? You don’t have to buy or read the entire book to enter, which would be a bit pointless to win a copy. Just go to the Read An Extract page which contains all of chapter one. Use the form on the Contact page or just email me at mp.drysdale@yahoo.com. The closing date is 17th December 2012. 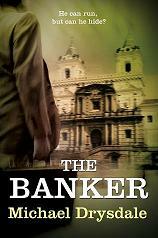 All correct answers will go into a hat and one lucky entrant will receive a copy of The Banker. A recent BBC program, part of the Imagine series, followed Ian Rankin as he writes a new novel. This was done using a mixture of interviews and video diary recordings. I found it interesting to compare the way he writes with mine. Ian Rankin gets his plot ideas from a file of newspaper and magazine cuttings that he collects over the year. I get some of my ideas from current events but I’m not so organized to file these away systematically. He planned to start writing his first draft on 2nd Jan 2012. At this point Rankin only has a vague idea how the plot will develop. I usually have a synopsis of about 50 – 100 words per chapter before I start, although I may add sub plots later the main plot doesn’t change too much in the course of writing. Rankin didn’t actually write his first word until a week later; I start up to a month late. Rankin managed to write his first draft by the end of February. I was impressed by his speed; I take between six to nine months to finish mine. Rankin’s first draft was peppered with comments such as ‘expand/do later’ rather than a complete, if imperfect, manuscript. My first draft is much the same. In the course of writing the second draft Rankin visits locations and makes notes of details to add to his story; I try to do this too although there are some locations I just can’t visit and have to make do with book/internet research. The program showed Rankin going through mood states experienced by many writers such as playing God, insecurity, being completely wrapped up in your current literary creation. Overall Rankin took 4 drafts and 6 months to have a manuscript ready for publishing; I took 7 drafts and 18 months. Still Rankin’s been writing for over 20 years and I’ve just started. I saw the new James Bond film, Skyfall, and although I thought it was good it did not live up to the much hyped ‘best Bond film ever’. In fact I wouldn’t put it in my top three list. The opening scene, a chase along the roof tops of Istanbul and hand to hand combat on top of a train, was quite exciting but there was nothing original about it. The film fasts forwards to Bond re-joining MI6 after suffering serious injuries and him feeling very aggrieved towards ‘M’. This was the best part of the movie showing the vulnerabilities of Bond and ‘M’; he from his injuries and she from the threat of enforced retirement. After an attack on MI6 headquarters the scene moves to a Shanghai skyscraper at night where Bond tries to apprehend a sniper. This scene had very little excitement and could have been anywhere, Dubai, Manhattan or Canary Wharf. Many reviewers really liked the villain; I thought he was too much like the Joker. Christopher Walken played a similar, but better villain in View to a Kill. There followed some chase scenes in the London Underground which were OK but not exceptional. A decision was made to cut down on gadgets which I think was a mistake. The final showdown in Scotland was far too long. Of course it wasn’t credible, which you don’t expect from a Bond movie, but it wasn’t that exciting either. Overall 3 stars. This is my second Coben book and although I enjoyed it, I didn’t think it was as good as Tell No One. I like Coben’s themes of ordinary people stumbling into criminal conspiracies. The story starts with housewife Grace Lawson picking up some developed photographs then to find included an old photo containing five people including her husband Jack. Jack sees the photo then disappears. The plot is essentially about Grace’s attempts to find Jack and the meaning of the old photo. The book is a page-turner and I kept wanting to know what happens next, which is a must in a thriller. But I did find there were a lot of characters to keep track of, and the connections between the various threads were a bit confusing. The plot relied on suburban housewife Grace having contacts with the local Mafia. This device was used, albeit with a bit more credibility, in Tell No One. It wasn’t possible to work out who’d done it from the clues and rabbits were pulled out of the hat in final chapters. The ending was rather disappointing; I was hoping that Grace would stumble on a high powered conspiracy and instead got something much more prosaic and quite unconvincing. 3 stars.